RIO DE JANEIRO, Tuesday. – Javelin thrower Sumedha Ranasinghe will be the penultimate Sri Lankan competitor to be seen in action at the Rio 2016 Olympic Games here when he takes part in his pet event at Olympic Stadium here on Wednesday (17). The competitors of the men’s javelin throw at 2016 Olympic Games will commence their qualifying round throws under two groups from 8.30 pm local time (5 am SL time on Thursday). The 25-year-old Lankan lad from Kegalle is confident that he could make a memorable Olympic debut, although he had stormed in to Sri Lanka athletics only a few years ago with a gold medal in Thai Open championship. Since then, he has progressed to take the Sri Lanka national record to his credit and a silver medal at the last South Asian Games in India early this year. “My initial target is to qualify for the final. I hope to clear a distance of over 84m and if I fare that well, hopefully I could earn a place in the final. I think that I stand a good chance of springing a surprise if I go for that target,” the final year undergraduate in sports science and management from the University of Sri Jayewardenepura said on the eve of his Olympic debut. “I have made a lot of sacrifices in this journey. It is not easy to progress in both sports and studies hand in hand. I want to prove a point that sportsmen should also be educated and gain professional qualifications to secure their future. Making to the Olympics, facing all those challenges is no easy task. 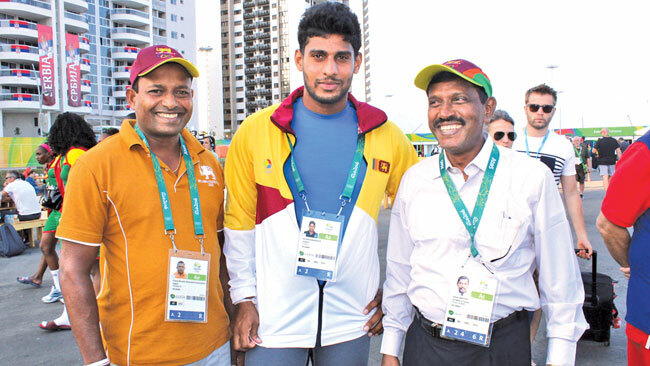 Now that I have made to the Olympics, I want to make the best use of it,” said Ranasinghe who became the first ever Sri Lankan hurdler to gain Olympic qualifying standards. Merely eight months after accounting for the Sri Lanka men’s javelin throw record, Ranasinghe is roaring to improve on his own mark at the highest level. Having cleared 83.04m at the South Asian Games trials at Diyagama last December, the champion hurdler intends to go over 84m in Rio. “I have been training hard this year and even my final preparations since arriving here two weeks ago have been good. I am in good shape and will make every effort to erase my own Sri Lanka record. Hopefully, I could make it to the finals as anything could happen in an event like this,” he said. He has been training hard under the guidance of experienced throwing coach Pradeep Nishantha. “Sumedha has worked hard to reach this level. He has made good progress and is capable of going for his target, if everything goes fine,” coach Nishantha told the media. If Ranasinghe could renew his Sri Lanka record and improve further, he could become a dark horse as recent global championships have thrown up some big upsets in this event.